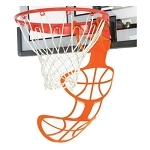 Product: Lifetime Portable Basketball System - 71523 Shatter Guard Lexan 54 inch Backboard Hoop Goal. 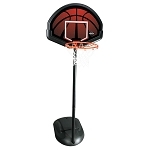 71523 Competition Series XL Portable Standard with Lockdown and a 54 Square Clear Makrolon Polycarbonate Backboard. 3 pc. 3.5 Round HT Power Lift Pole, Orange Slam-it Pro Rim, Blow-molded Frame Pad. 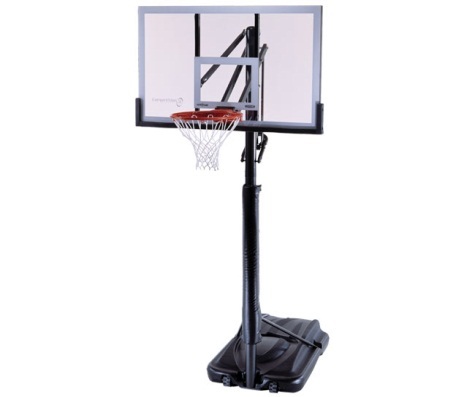 Lifetime portable basketball systems provide an excellent solution for your home basketball court when you cannot or do not want to cement a basketball pole into the ground. 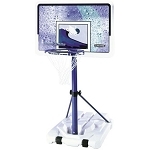 The 71523 features a 54 inch polycarbonate backboard and an XL portable base. The portable base can be filled with sand or water to weigh down the base. 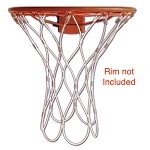 Order your Lifetime portable basketball hoops here. *Let us know if you find this item for a lower price and we will give you a special deal! The 71522 has an Acrylic board for improved rebound and less flex, but is less strong than the polycarbonate boards that the 71524 and 71523 have. The 71523 has a pole pad with it. Also, the 71522 and 71523 have 1.5 inch deep frames, and they have rigid extension arms that mount directly to the board frame. The 71524 has a 1 inch deep frame, and uses standard straight extension arms that mount to the backboard brackets instead of directly to the backboard. Our experience at Competitive Edge is that customers rarely if ever can tell a difference between the products during play. They are all great systems that will last many years. Prompt delivery. Excellent quality product. Fast Shipping & the item was in perfect condition! Thank you! A very nice basketball system for the price. It looks great in the driveway! If you purchase this system, be prepared to put in some time to assemble the product and get the help of a good friend. It really takes 2 people to assemble and will take a number of hours. The assembly instructions are easy to follow and you will need a drill. The hardware parts come in separate bags for each part of the assembly ensuring you use the correct parts. We did have a wrong part shipped in one of the bags, but the customer service department sent us new parts with no questions asked. All in all, a nice experience and a solid product for the price. Dimensions: 55" x 34" x 13"